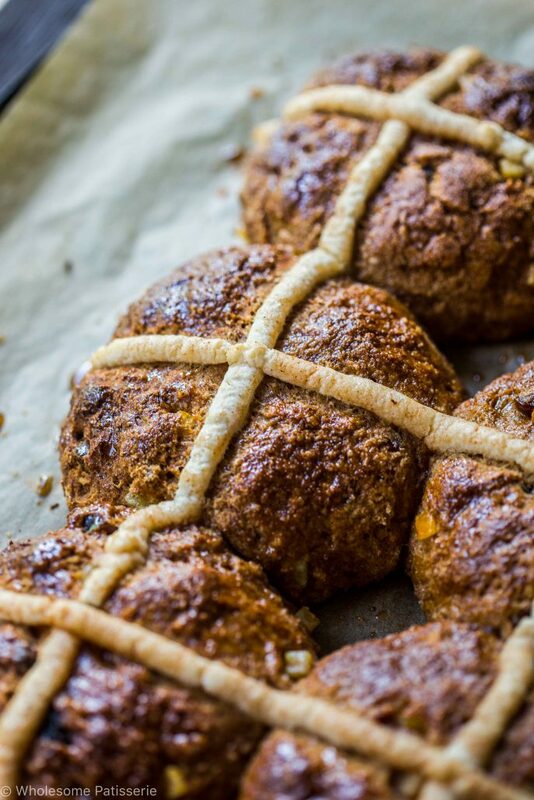 Besides the chocolate (of course), my most favourite part of Easter are the hot cross buns. 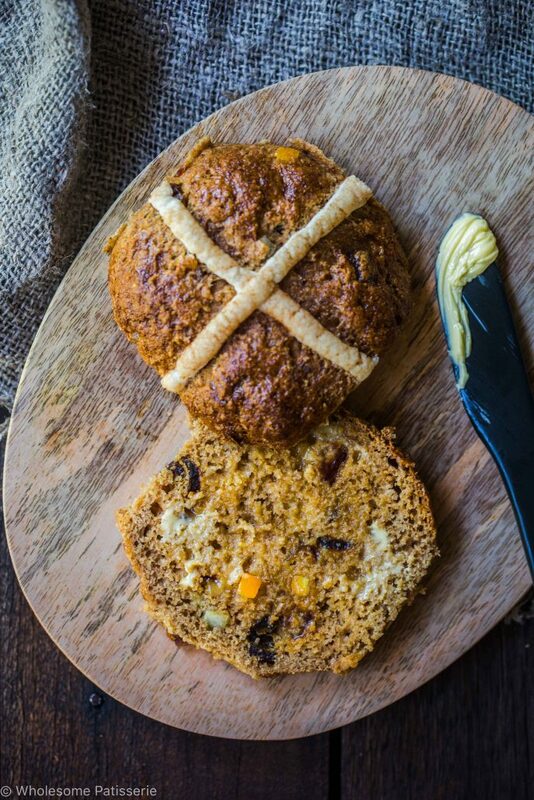 Warm and inviting, filled with spices, classic dried fruits and best of all, that glorious hot cross bun glaze. Bath your buns in the glaze straight from the oven and that is what I call the magic of Easter, plus a side of chocolate bunnies! What is your favourite part of Easter? I know many people actually gift their family and friends with PJ’s and other bits and pieces. We only have ever given each other chocolate eggs and make an abundant amount of hot cross buns. I love to toast them for breakfast with a smothering of butter and a fresh one for lunch. That gorgeous smell of allspice, cinnamon and nutmeg has my heart forever over Easter! My Mum has made regular hot cross buns in the past but since she discovered her gluten intolerance a few years ago, we struggled with hot cross buns during Easter. 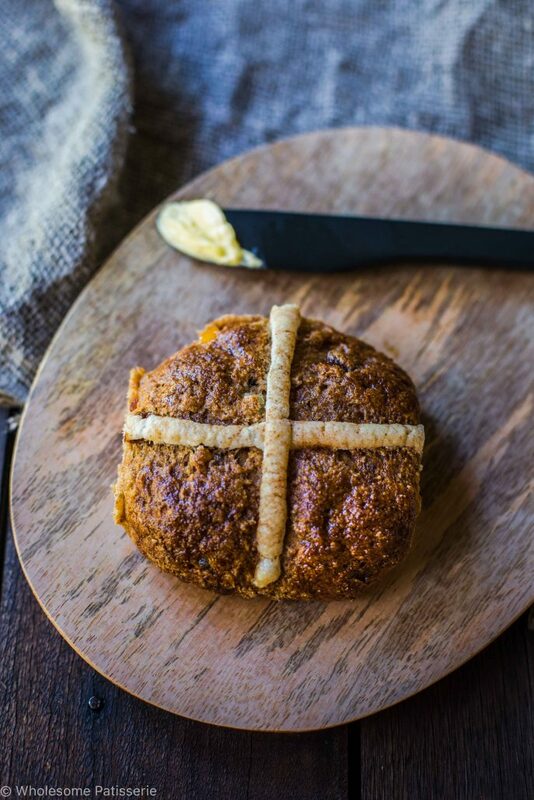 I have finally found a fantastic gluten free and dairy free hot cross bun recipe. I found this recipe, which I made a few minor changes too, from Jamie Oliver’s website, created by Four Spoons Bakery. Unfortunately, I cannot seem to locate her website anymore so I will link her Facebook for credits. If you still struggle with gluten free baking, as do I, this particular recipe and it’s structure and elements is a great starting point to create all types of gluten free yeast breads and rolls. I love the psyllium husk mixture. It acts and mimics gluten. 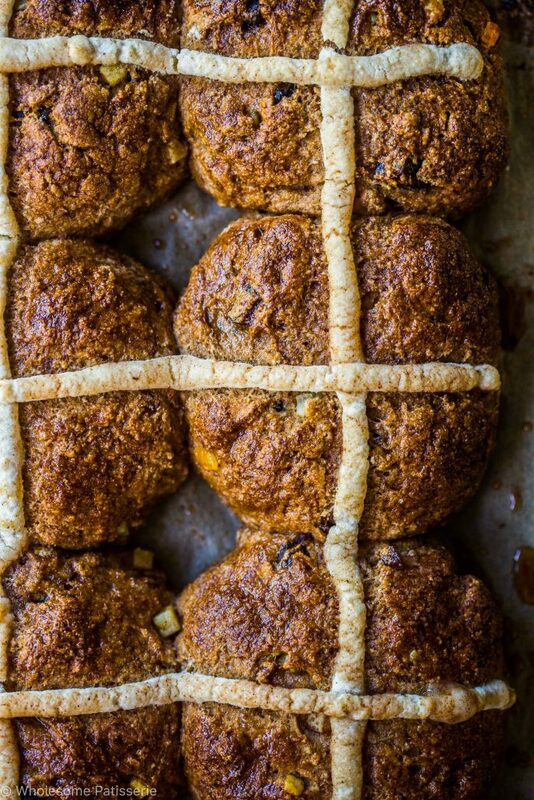 It provides structure and elasticity in the hot cross buns, just like regular gluten would. Absolutely fantastic! 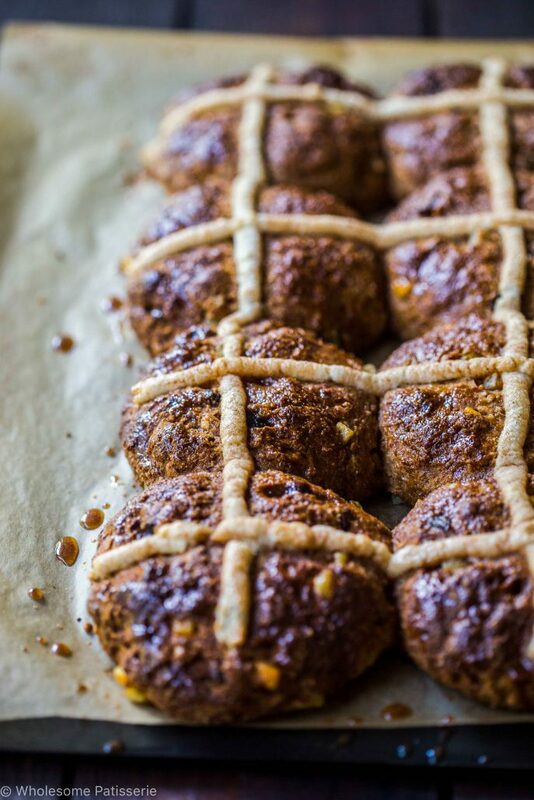 I hope you enjoy these amazing gluten free hot cross buns this Easter! They are simple, even though the recipe is quite long but I wanted to get into all of the details. I hope to see your creations of these beauties! Enjoy my friends!! Preheat oven to 200°C (390°F). Line a flat baking tray with parchment paper, set aside. Combine all ingredients in a small bowl and whisk well. Cover with a lightweight tea towel and place in a warm area. Outside in a warm temperature is great, just place it in the shade. In a medium sized mixing bowl, add psyllium husk, guar gum (or xanthan gum) and eggs. Stir until just combined. Pour in boiling water and mix until well combined. Set aside on your kitchen bench to thicken. By now, the yeast mixture should be activated and doubled-tripled in size. If not, leave a little longer in a warm area. Stir the psyllium mixture, it should be nice and thick. Add psyllium husk mixture to the dry ingredients and then pour is the yeast mixture. Mix everything together with a wooden spoon or spatula until well combined and there are no dry lumps. Turn sticky dough out onto a lightly floured surface. Pat your hands in a little flour. Bring the dough together with a little more flour. Evenly divide dough into 8 equal balls. NOTE: I weighed the entire dough and divided it by 8. The resulting weight is what each ball should weigh. Gently form each into round buns, adding more flour if dough is too sticky. Place each bun onto prepared tray, leaving a 2-3cm gap between them, as they will grow. Once each bun is formed and placed on the tray, cover tray with a lightweight tea towel and place in a warm area to allow the balls to raise. Approx. for 15-20 minutes or until nearly doubled in size. In a small mixing bowl, combine sugar and spices. Gradually pour in water, mixing well, until it forms a glaze like consistency. More on the watery side, not thick. Set aside. In a small bowl, combine flours and sugar. Gradually pour in water, mixing well, until a thick, smooth, pliable texture. Just like a wet dough. Set aside. Once dough buns have risen, pour cross mixture into a piping bag or a zip-lock bag with a small cut to on of the corners. Slowly pipe a cross onto each bun. Bake for 15-25 minutes or until nice and golden. Remove and set aside, leaving the buns on the tray. With a pastry brush, dip it in prepared glaze and brush each hot bun until desired amount of glaze on each. Serve warm or store for later. *You can find psyllium husk in any health food store or supermarket. This is an essential ingredient as it mimics gluten in this gluten free recipe. **You can find guar gum and xanthan gum in any health food store. I personally use guar gum. These are essential as they also act and mimic gluten. ***I used dried pitted dates in my recipe, only because I was out of sultanas. You can also use currants or add in any of your favourite dried fruits. The dough will be more on the sticky side. It’s important to have a floured surface and to also have your hands floured to ensure the dough doesn’t stick too much to your hands and the surface. It will form a lovely bread dough though. Make sure the flour cross mixture is thick enough to pipe onto the buns. You don’t want this too watery so slowly pour in the water whilst stirring until the correct consistency is reached. I like to brush on my glaze when the buns come straight out of the oven. This will allow the glaze to soak through and stick to the buns. Perfect for my dairy-free son. I’ll be making these this Easter.